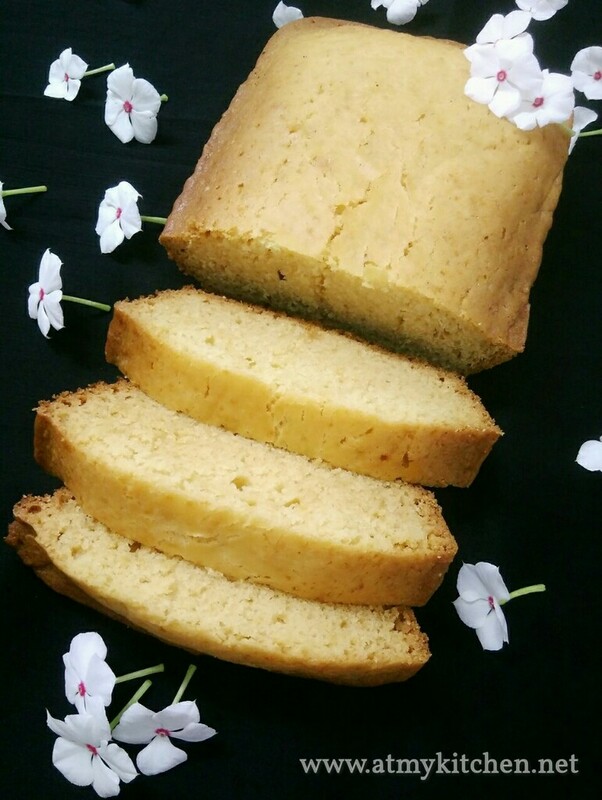 Ghee Cake is an easy and simple cake. 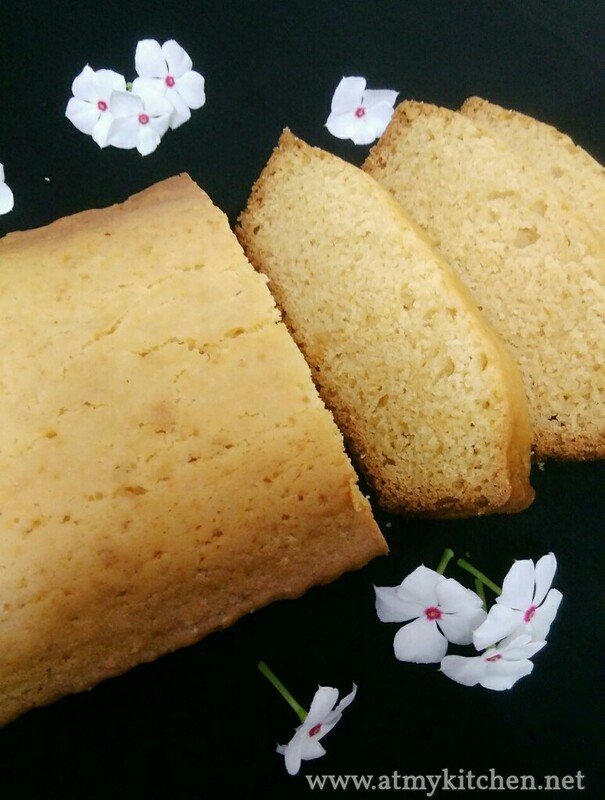 It is a super soft, spongy, moist, aromatic cake. It is prepared using ghee and all purpose flour. 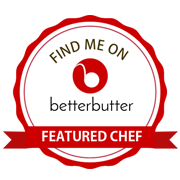 Ghee is the main ingredient here in this recipe. I have made this an Eggless version by using curd as a substitute for egg. You make it an egg version by replacing 2 eggs with curd/yogurt. 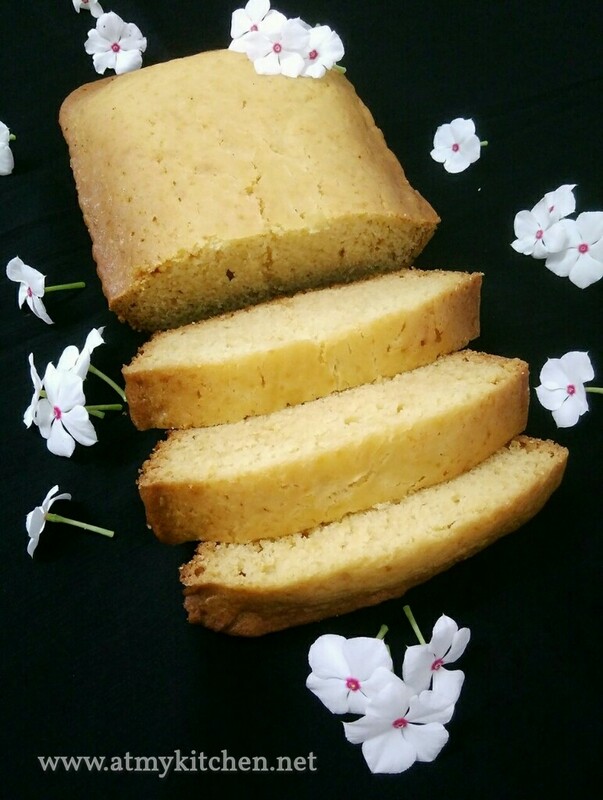 Ghee cake is one of my favourite tea partner cake. 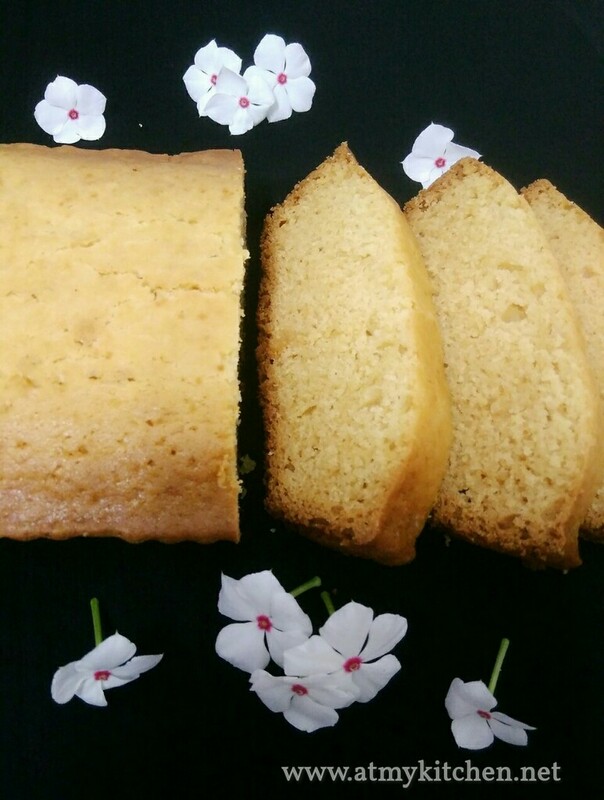 I love baking this cake as it is so simple and easy to prepare and the aroma that lingers my house whole baking this cake is heaven and i just love that. 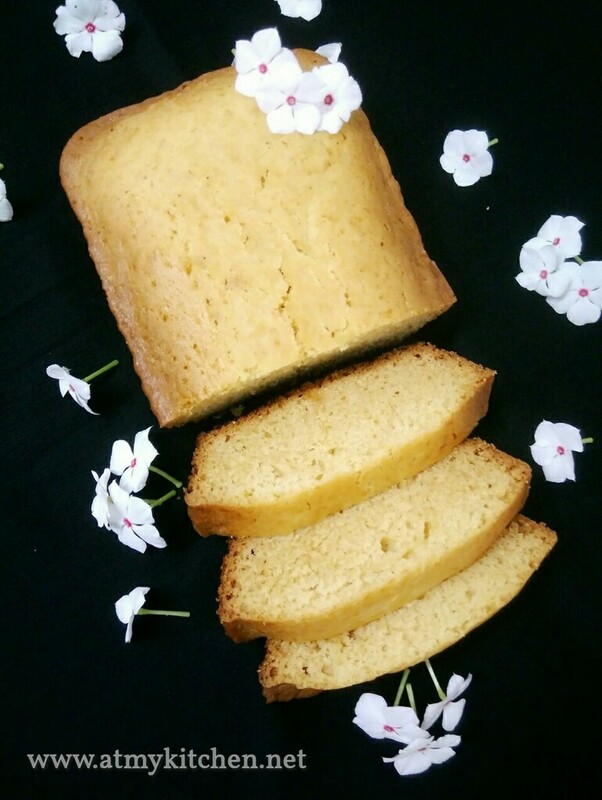 This bakery style ghee cake is a delicious and just melt in the mouth cake. It is an awesome and wonderful no fail recipe. So if you like bakery style cake then why wait, try this no fail recipe and I bet it won’t dissappoint you. This ghee cake can be prepared for any party, family get-together, friends, tea time snacks or for any special occasions. Sieve the flour 2-3 times, this helps in getting a nice texture to the cake. Baking time may differ since the temperature varries from oven to oven. Mine took exactly 35 mins. Do not open the oven frequently to check the cake while baking is in process. Always use the perfect and correct size of cake pan. In a mixing bowl add the curd and baking soda. Mix them well and keep aside for about 10 mins till the soda react with curd and bubbles. Sieve the flour and baking powder 2-3 times and keep aside. In the curd mixture add sugar, ghee, milk, vanilla essence and mix well. Add in the flour mixture and gently fold and make a smooth batter. Grease the cake pan with ghee or oil. Pour in the batter to the greased cake pan and tap 2-3 times. Bake @180° for 35-40 mins. A tooth pick inserted should come out clean. Mine took exactly 35 mins. Remove from oven, let it stand for about 5 mins and invert. Let it cool down completely, cut and serve. Wonderful recipe.. very easy.. My 14 yr old son baked it for us… N v tried it in my mom’s old aluminium tin (ring shaped) n used gas stove instead of microwave..